Today we are in Lebanon to taste their famous Kaak bread. Kaak a humble bread, baked in simple ovens, adorned only with sesame seeds and stuffed with zaatar, processed cream cheese or knefe cheese before being eaten. It is a very famous street food in lebanon and you can see many street vendors, hanging these purse/bag shaped breads in their carts and selling around, you can have a look here on how they are baked. It is also stuffed cheese, zaatar to make it even more irresistible. I tried my hands in making a simple kaak bread, with just sesame on top. Loved the shape of this bread first, that is what dragged me towards it. It was fun baking it and as usual the taste of this arabic beauty was awesome when paired with some hummus and labneh, i used homemade hummus and store-bough labneh to go along with this delicacy. Take both the flours,yeast, salt and sugar in your food processor bowl.Pulse it twice to mix well.Now with the processor running, slowly add milk and knead to make a soft dough. Transfer the kneaded dough on to a floured surface and knead for 5 minutes to get a smooth dough. Let the dough rest covered for 15 minutes. After 15 minutes divide the dough into 8 equal parts. Flour your work-surface generously with flour and take a dough ball and start rolling it out to a 5-6 inch circle. Do not roll it out thin, it should be a bit thick. using a 2 inch small bowl, cut out a small circle near the edge of each circle, so that each bread looks like a purse with handle. Grease a baking pan with oil, place rolled out circle, on the pan. Brush with milk and sprinkle sesame seeds. Let it rise covered for an hour. Preheat the Oven 200 C. Bake for 10-12 mintes or until golden and puffed. Take it and serve it warm with some hummus and cream cheese. Sending these cuties to Come, join us for breakfast, happening @ +Srivalli Jetti's space, also to Bake Fest #35, happening @ Nalini's Kitchen, an event by +Cooks Joy. What a cute shape! I love your bread finds. I would love to try this. love the shape of the bread , and the cutie pie holding it :) very very healthy bread looks fantastic !! Btw the bread is awesome. 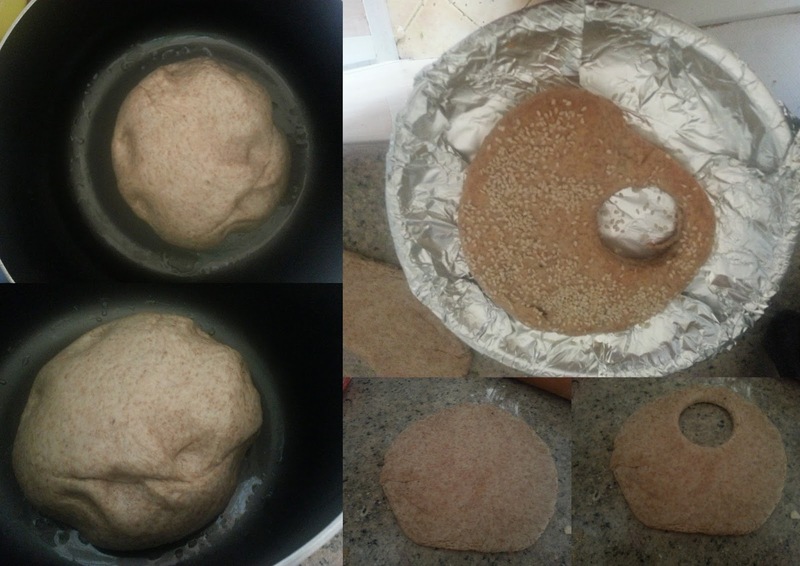 Love that first click, such a damn cute model you have, love the way you prepared the bread with wholemeal bread flour. Such an interesting shape to the bread, Priya! And hugs to the cute model ! Lovely preparation and wonderfully presented ! Loving these cute purse shaped kaaks. That is a lovely bread and even the shape is so cute. Nice bake. Many of the recipes for these middle eastern countries are cross countries. Priya this is amazing. I love your first pic.